Update! This class has ended, but you can download the free pattern! 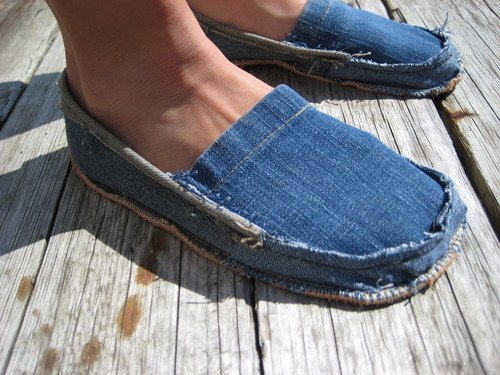 In this class you will discover how to turn an old unloved pair of jeans into hip, recycled slippers. Sarah Anderson will take us through marking out a pattern, cutting all the parts, and stitching them together to make one of a kind, custom slippers. Did we say these things are COMFORTABLE! Bring an old pair of jeans and your can do attitude. We’ll provide material for the soles and all the tools and sewing machines needed. Room is very limited! Just 5 spots available! By Paypal to register@DoNight.org – put ‘DIY Foot Wear’ in the note area. This entry was posted in regular and tagged classes, DIY, foot wear, recycled, sewing. Bookmark the permalink. Both comments and trackbacks are currently closed.